ITF in Science Mode until 04:20UTC. The unlocked seems caused by the injection (see plot). ITF relocked and back to Science at 04:48UTC. In fact the earthquake did not produce large oscillation of the suspensions, always present in case of magnitude 6.5 (for what I knew). Moreover the lockloss occured 2 hours after the event, which is quite a lot. It is all very strange. 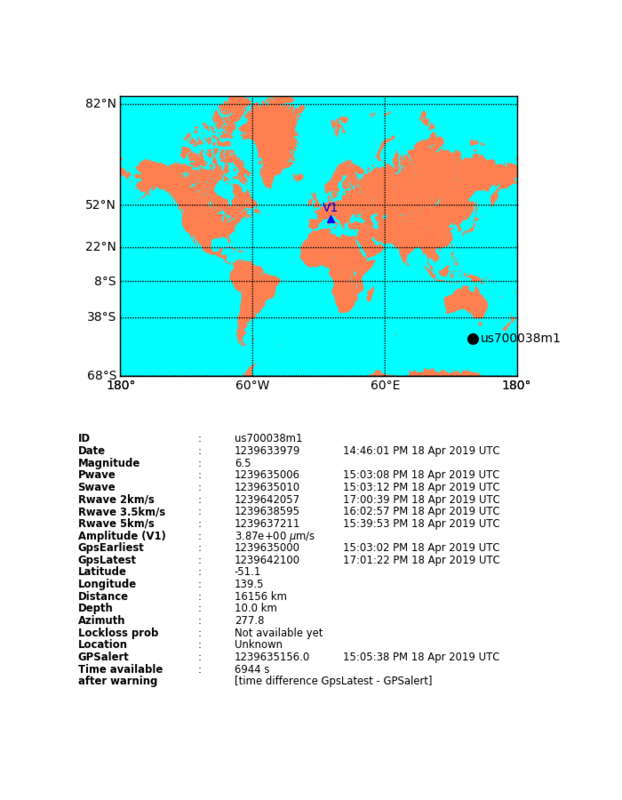 ITF found in Science Mode, it unlocked at 16:46 UTC due to an Earthquake of Magnitude 6.5 in Australia (see attached image). ITF back in Science Mode at 17:14 UTC with 50 Mpc. The suggested procedure for the earthquake ( see report #45661) was not applied because the flags related to SUSP didn't became red before the unlock. The Expert is informed of this event. the lock survived but not the squeezing injection which was in trouble because of powers fluctuation, thus I I left the ITF out of science for a while waiting the earthquake to calm down, then I came back to the standard lock configuration (NE/WE marionette) and started science at 6:30UTC. MdDQ restarted at 5:06UTC, after killing the cm name. After the calibration shift the integrators used by the feedforward, needed for 50 Hz active removal, that is running on WI mirror DSP, were over-charged. This apparently caused a slow deacrease of the horizon during the night. The FF has been opened, the integrators discharged. The loop is now closed again. To avoid the issue, in the future the FF should opened using the FF_ENBL gname before calibrating. Figure 1. The range is slowly drifting down since yesterday evening. Figure 2. Shows the h(t) spectrogram at around 00:00 UTC on Apr 18 a bump around 105Hz appearing. Figure 3. Compares the h(t) spectrogram on Apr 17 22:00 UTC, and Apr 18 7:00 UTC and the bump between 100Hz and 110Hz. 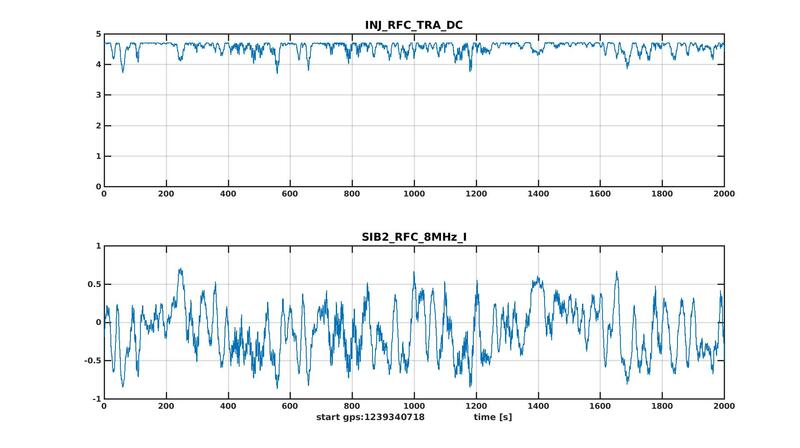 Figure 1 and 2 shows DAQ_FMOD_56MHz_mag spectrogram over the past week. After the maintenance on Apr 16 there is much more noise on DAQ_FMOD_56MHz_mag with bumps at 20Hz, 45Hz, 90Hz. This is probably related to the troubleshooting of ISYS. 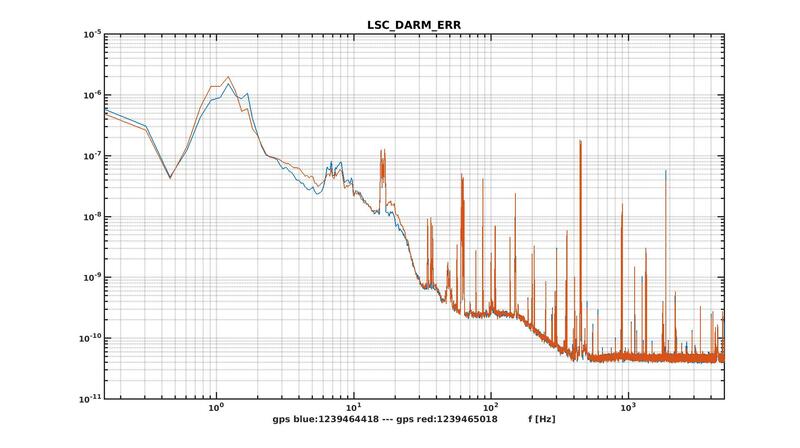 Figure 3 shows there might be a small impact on DARM around 40Hz. Figure 4 shows that seems to be subtracted well in h(t), but it would be good if someone can check this more carefully. ITF in Science Mode for the whole shift. Horizon at 49Mpc. 02:11UTC - MdDQ crashed. I tried to restart it via VPM and via shell without success. Experts have been informed. ITF found in Science Mode. Switched to Calibration Mode at 15:00 UTC to start the weekly planned calibrations. The activity was carried out with the help of L. Rolland and D. Estevez ( see entry logbook #45669). Back in Science mode at 19:56 UTC with PRCL->SSFS subtraction. DF_INtoEND_LN2 - Relock began at 18:04 UTC, the ITF unlocked at 18:18 UTC. LOW_NOISE_3 reached again at 18:35 UTC, the calibration was executed from 18:46 UTC to 19:00 UTC. Today at 15h UTC, the first calibration period of O3 was started. The updated procedure was followed by Andrea M., and we improved a bit the procedure accordingly. move the LED used for PCal timing calibration on the NE and WE PCal reflection benches (around 16h45-17h45 UTC). inject with the NE NCal around 19h30-19h45 UTC. Some injections lasted for longer time than expected. We will tune them for next Wednesday to reduce a bit calibration duration. The measurements with ITF unlocked lasted for about 1 hour, so the relock from cold ITF was a bit long, and relock failed at first attempt. We modified the calibration sequence in the procedure to relock the ITF (for InToEnd calibration) between the unlocked measurements, to have an intermediate relock, between two shorter unlocked periods. The channel SDB2_B1p_PD1_Audio_1MHz_DS is already acquired. It is stored in the raw_full ffl for the past few days. It is also stored for 50 s every 1000 s in the raw ffl (looking at GPS times multiple of 1000). We can find data with RFC close to the resonance for enough time (fModErr was by chance zero already at the beginning of the lock). 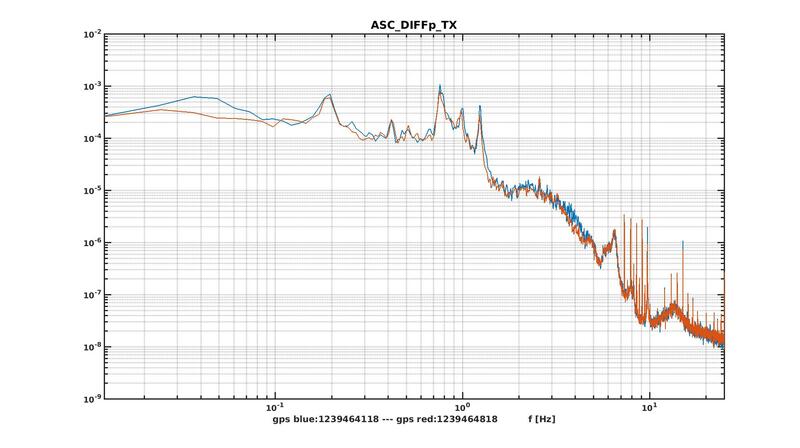 The spectrum of RFC_8MHz is shown in fig 2. We can do a comparison of the possible error signals for CARM control. Paola is suggesting to use the OMC to control the CARM degree of freedom at low frequency (so use the OMC as a reference cavity). Figure 1 shows the error signal of the two OMCs. In purple before the OMC dither reduced at the end of March, and in blue the current situation. 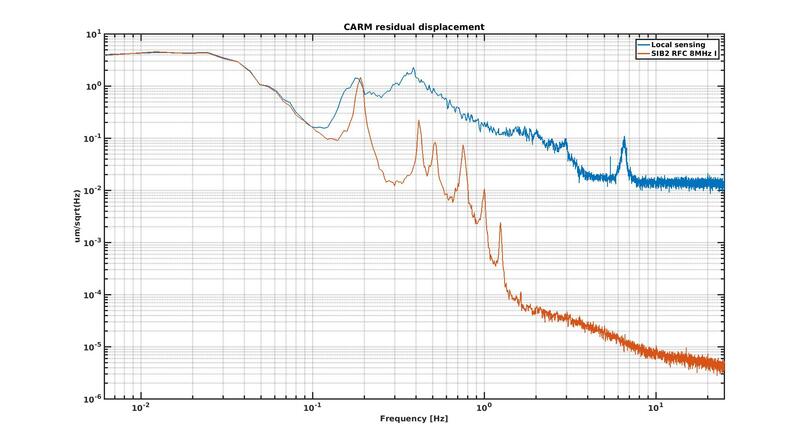 With the reduced OMC dithers the OMC1 error signal still sees the CARM motion below 1Hz but with a small SNR. With the larger dithers (which were not impacting the BNS range), the peaks of CARM motion are 2-3 orders of magnitude above the error signal noise. The dither could be increased for just one of the two OMCs, probably OMC2 that has a cleaner signal. ITF found in Science mode. At 5:47 UTC Science mode was automatically interrupted because of "Pump phase reset" of the squeezer. The event was predicted by the DMS as the flag Squeezer became red around 5:06 UTC. At 5:49 UTC ITF back in Science mode with Squeezing injected. ITF left in Science mode. work on the ACS of Control building; no effect on ITF. Annalisa mentioned that for some investigations of parametric instabilities and to understand better the arm cavity losses it would be interesting to have B1p_PD1 just after arriving to dark fringe. Figure 1 shows a lock acquisition, B1p_PD2 is alway open, and B1p_PD1 sees about 10 times more power, and is opened only at step 124. B1p_PD1 saturates at ~50mW, so it can't be kept open when the MICH offset is 0.1, but it could be open just after. A simple improvement would be to put the B1p_PD1 opening when entering state 120, so when entering the LOCKED_PRITF_DF state. This would reduce the delay from 100s to 10s (some more complicated solution could be possible to reduce the delay by a few more seconds). For the parametric instabiltiy B1p PD1 audio would need to be put back in the data with 1MHz sampling, but probably only in the raw_full data that are stored for a few days. ITF in Science Mode for the whole shift. Horizon at 50Mpc. TankLN2 -> VAC..WE1_LN2_BAR still red from yesterday after the maintenance activities; it should be coming back under threshold in next hours. 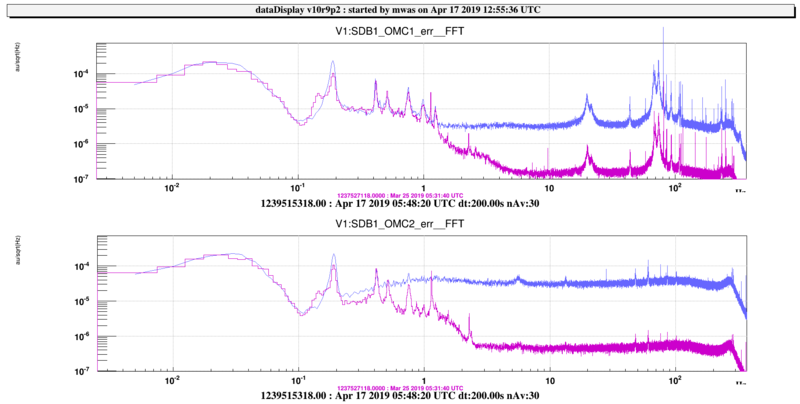 The first part of the shift has been dedicated to complete the commissioning activities: Squeezing, SSFS normalization, "earthquake configuration" for the ITF. 15:59 UTC - Science Mode. 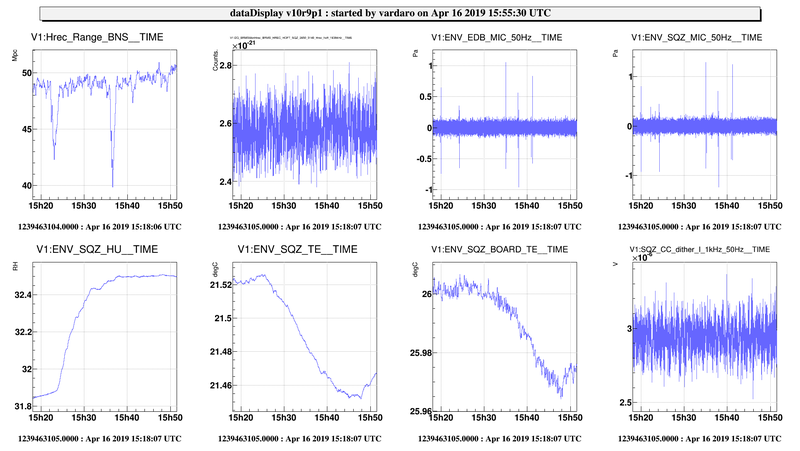 16:18 UTC - B5_PD1 Vbias enabled, shutter reopened (operation done in 1 second therefore we decided to left the Science Mode and annotate the GPS time). TankLN2 -> VAC..WE1_LN2_BAR is red after the maintenance activities; it should turn into green in the next hours. As observed a few times, in certain environmental condition (strong wind or earthquake) the lock is lost due to the saturation of NE/WE MAR_Z_CORR. Having the availability of NI/WI MAR actuator, with range a factor of 4 larger, the best thing to do in that condition is to move the MAR actuation from NE/WE to NI/WI. Today a short test has been performed, doing that in LN3 (in quiet environmental condition). The aim was to check the impact on ITF stability and on hrec. 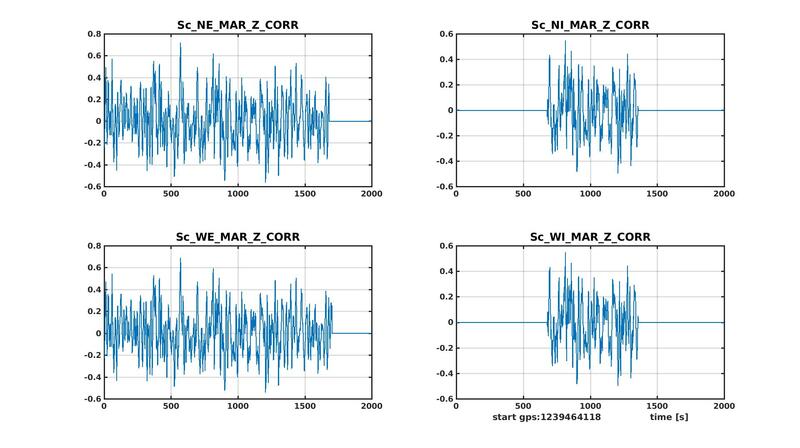 In Fig 1 we see that when the correction is moved to NI/WI, apparently nothing change on NE/WE. This is due to a modification of NE/WE probes: even if the correction is actually switched to zero, it is still visible because now the signal sent to the probe is the one before the switch (if the switch is 1, the probe is taken in the same place as before, after the switch). So for hrec everything looks unchanged. In fact a small difference is there: the calibration lines are not anymore in the probes, so the line subctraction does not work anymore (fig 2). A second, more relevant, difference is that the calibration of NI/WI actuators cannot be exactly the same of NE/WE. 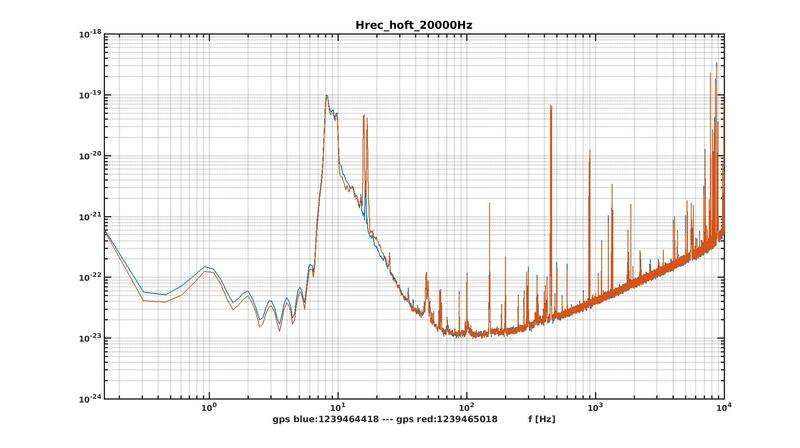 In particular, there is a relevant difference in WI reallocation filter (a notch at 6.96 Hz, added in order to avoid an oscillation during the lock acquisition). This fact has for sure an impact on the reconstruction, at least at low frequency. An effect, maybe due to this, is visible in DARM at 20 Hz (fig 3). This is just to say that, in case the INPUT reallocation is required to avoid an unlock, it is correcto to put the ITF in adjusting mode. The test has been performed also to check if NI/WI actuation balancing is good enough. 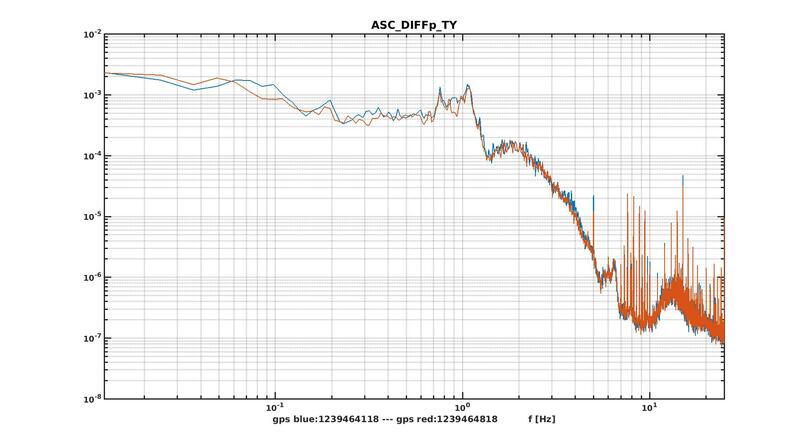 According to DIFFp_TX/TY accuracy (fig 4, fig 5), it looks like that. Considering the test successful, a procedure to move to NI/WI MAR can be released. At 1239463445 16 Apr 2019 15:23:47 UTC we opened the three top panels of the Acoustic enclosure (the panel of the pipe remains closed) while the air in the DET lab was kept in 'Portata Ridotta'. We exit the DET lab and waited in the SAS. At 1239464156 16 Apr 2019 15:35:38 UTC we closed the acoustic enclosure. Attached plot: status of relevant channels vs time from before to after the measurement. The squeezing level remained stable, wheares the BNS range dropped during the opening/closing operations. After the maintenance we proceed to the implementation of the normalization of the SSFS loop, to avoid the unlocks due to the combination of ITF cold + feed-forward of PRCL/SSFS. For this purpose Alain added the possibility of multiplying the present normalization by the ratio between the B4 112MHz and the maximum value of this channel when in LN3. This option is engaged with a switch called B4_DC_rescale, which is turned on when we reach LOW_NOISE_1 (line 2928). We also set the value of the maximum value in the previous lines (line 2926, 2927), and it is read from the ITF_LOCK.ini, section LOW_NOISE, variable b4_112_max. The switch is then turned off in the DOWN state (line 590). We tested one lock acquisition, we set the UGF to 9kHz and it failed. WE tried again and we adjusted it to a more higher gain, around 10400Hz (b4_112_max = 0.00756), and it worked. So for the moment we let it implemented. If it does not work, it is enough to comment th eline 2928. 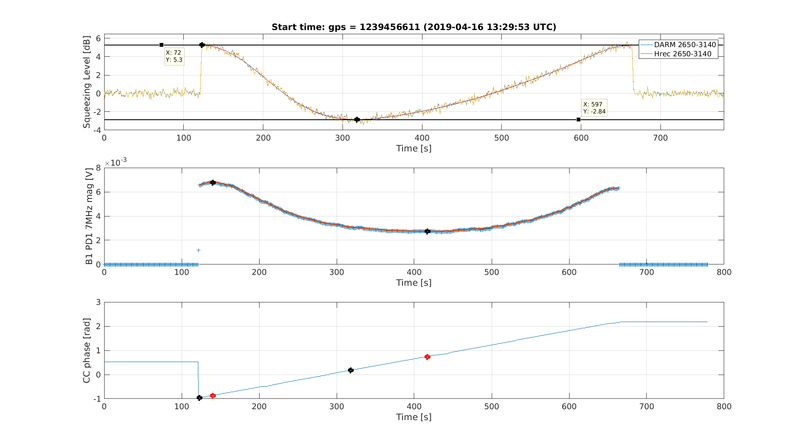 At GPS = 1239456611 we performed a CC phase scan to optimize the squeezing level (length = 780s). The plot of the phase scan is shown in the attached Figure. The distance between the minimum of the magnitude and the best squeezing level is -0.61 rad. With the scan we found -2.8 dB of squeezing and 5.3 dB of anti-squeezing. The CC phase that maximize the squeezing is 0.21 rad and the slow CC loop set point is 0.6e-3 V.
Before the tuning the optimal squeezing phase was 0.54 rad and the slow CC loop set point was 0.15e-3 V. Thus before the optimization -2.2dB of squeezing were injected. This morning I installed a DCG24d unit (custom made power supply used in the INJ DC Power Distribution) in rack INJ1 in the DAQ Room as a spare for the O3 Run. At 5:20 UTC ITF in Calibration mode to perform the scheduled magnetic injections. At 10:00 UTC all the activities were concluded. At 10:05 UTC ITF in Troubleshooting because the ISYS was unstable; Gabriel and Camilla were able to fix the problem. They discovered that during the maintenance some ISYS electronics was accidentally switched off; this had as a consequence that the ITF was not lockable any more (for more details see dedicated entry). At 11:51 UTC ITF locked with squeezing injected and PRCL->SSFS subtraction disabled. At 12:02 UTC Troubleshooting mode stopped. At 12:12 UTC ITF in Science mode with a bad sensitivity; Horizon around 43 Mpc. At 12:44 UTC ITF in Commissioning mode for Squeezing activities. At 12:54 UTC I enabled the PRCL->SSFS subtraction and I reloaded ITF_LOCK.py with the lines uncommented. UTA DET in portatat nominale from 6:39 UTC to 9:46 UTC for work in DET LAB by Romain. standard check and refill of the TCS chillers. from 10:05 UTC to 12:12 UTC because some ISYS electronics was accidentally switched off in the maintenance break; see next dedicated entry.